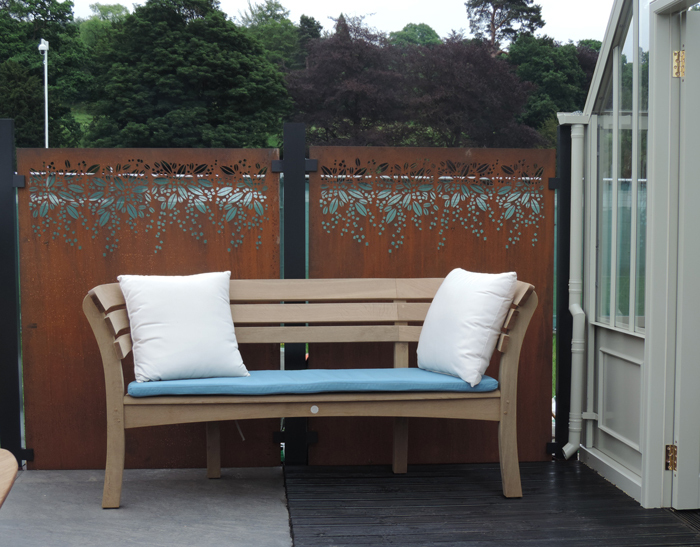 A new range of contemporary screens for your garden, boasting an elegant 17th century design, has launched in a new collaboration between Stark & Greensmith and the Royal Horticultural Society (RHS). The Parterre range includes four laser-cut panels which can add instant ‘show garden’ impact and privacy to a space, featuring beautiful designs inspired by images from the world-famous RHS Lindley Library. Stark & Greensmith’s creative director, Martine Le Gassick, worked with the RHS to create the new range which has intricate engravings of knot gardens and parterres from ‘The English Gardener’ by Leonard Meager (c1624-1704) first published in London in 1688. 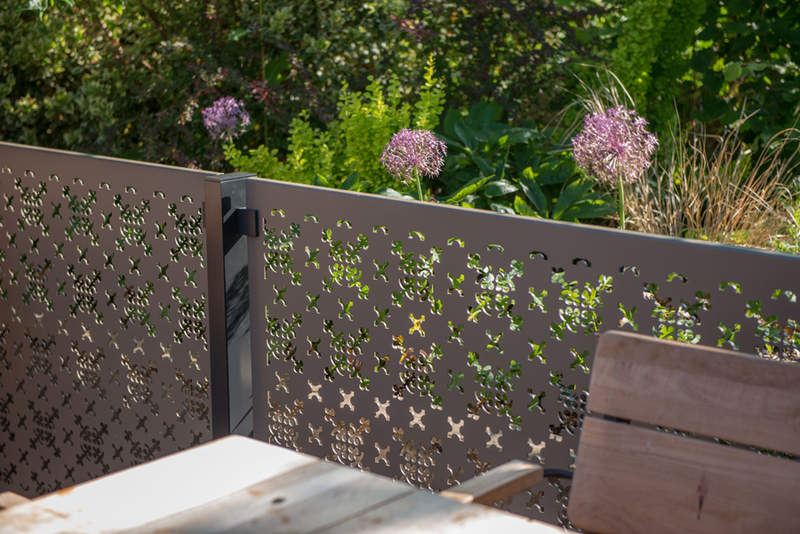 Available in both full-height (1.78m H x 1.19m W) and balustrade (0.93m H x 1.48m W) panels, in two finishes – corten steel and a new warm grey-hued power-coated aluminium – these stunning screens can be used as boundary fencing and on terraces or decking to create a dining or seating area. 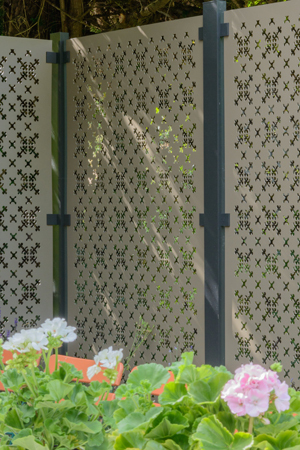 They can also act as solar shading in pergolas, for screening in the garden or as garden dividers to create ‘rooms’. If you position a panel against a wall and light from behind you can get a real ‘wow’ effect – I particularly like the way you can see what’s behind them through the design so you are not shutting out your garden. The panels are not only sought after by gardeners wanting a ‘show garden’ look at home but also by designers who want the contemporary look for their show gardens. Tony Woods used a bespoke design from the company for his 2018 RHS Chelsea Flower Show garden ‘Urban Flow’ which scooped Best Space to Grow Garden and Gold. Tom Massey also used them on his Lemon Tree Trust show garden at Chelsea. They were also used on the Alitex Ltd., stand at this year’s RHS Chatsworth Flower Show (pictured above). Beside the new Parterre range, the core Stark & Greensmith range is predominantly inspired by nature with the best-selling design Branches, designed to simulate the effect of dappled sunlight through foliage.